Manor Farm has fallen on hard times, and Farmer Jones takes it out on his animals. Prize boar-hog Old Major calls a meeting, attended by his fellow pigs, Boxer the horse, Benjamin the donkey and the other animals. Old Major tells them that while he will die of old age, the others probably won't. The farm is rich enough to support them all if they overthrow Jones and take control- but without adopting his vices, as all animals are equal. The animals sing, cluck, bark, squeak and whinny a song of solidarity, and Old Major dies. The next morning, the animals break into the grain store after Jones forgets to feed them. Sensing a new determination about them, Jones runs to the pub to get reinforcements. The fighting is fierce, but the humans are forced to flee. Napoleon leads the animals into Jones's house. They agree that it is no place for them- but Napoleon sneaks back inside afterwards. He adopts a litter of puppies following their mother's death. The animals draw up a code of conduct: no animal shall sleep in a bed, no animal shall kill another animal, and so on- culminating in the principle that all animals are equal. 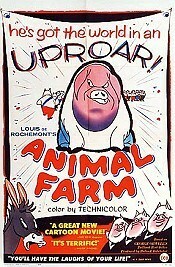 The farm is renamed Animal Farm, and the animals take over the humans' old jobs. Boxer attracts admiration for his tireless dedication, and the farm becomes far more productive than before. A meeting is held to discuss the farm's future, the pigs tabling a resolution to spread the revolutionary message to other farms. Napoleon's right-hand pig Snowball analyzes the farm's social and power structure. Winter comes, along with cold and shortages. Snowball devises a plan involving the animals working more and eating less, but the outcome will be electricity, heat, light and general luxury. Napoleon dismisses this as fantasy, and he sets his dogs (the former puppies) to drive Snowball into exile. Napoleon adopts the fat pig Squealer as his mouthpiece, and he denounces Snowball as a traitor. Abolishing collective meetings, he says that he'll look after the animals' interests. A windmill is constructed, working the animals to exhaustion. However, they get less food than the pigs, who claim that they need it for their brainpower. Boxer and Benjamin discover that the pigs have moved into the farmer's old house, and that they are sleeping in his bed. This contradicts one of the farm's edicts, but the animals decide that they've interpreted it wrongly when the words "with sheets" are added. A trader named Whymper starts doing business with Napoleon. Squealer announces that the chickens will produce eggs for consumption, but they rebel, causing Napoleon to summon his dogs. At a show trial, animals are sent into exile, and the words "without cause" are added to the edict about them not killing each other. Napoleon announces that the revolution is complete, and that the revolutionary song is banned. Whymper's success is noticed by the jealous farmers, who march on the farm and blow up the windmill. It is painstakingly rebuilt. Years pass, and a new generation of pigs grows up. The windmill has still not been finished, and finally, Boxer collapses in exhaustion. Napoleon is told that Boxer will never work again. Benjamin predicts a well-earned retirement, but a strange van arrives. Finding Boxer gone, the animals run after the van, but they cannot catch up. They see Boxer whinnying in fear, as the van is going to Whymper's glue factory. They return to the farm to hear Squealer claiming that Boxer died naturally, and that his last words were in praise of Napoleon. No one believes him. The pigs drink to Boxer's memory with the whisky that they received from Whymper in payment. More years pass. The revolution is forgotten. The farm prospers, but only the pigs are better off than they were. Pig delegates from far and wide arrive at Animal Farm to celebrate the coming of a new era. The other animals stand outside reading a new sign: "ALL ANIMALS ARE EQUAL BUT SOME ARE MORE EQUAL THAN OTHERS." Do you have anything to add to this page? Have we made any mistakes... or do you have any additional information about Animal Farm? If so, we would love to hear from you. Please send us a quick note with your additions or corrections to this page, and we will make the corrections as soon as possible! Below are comments about this cartoon submitted by people who have seen this show. 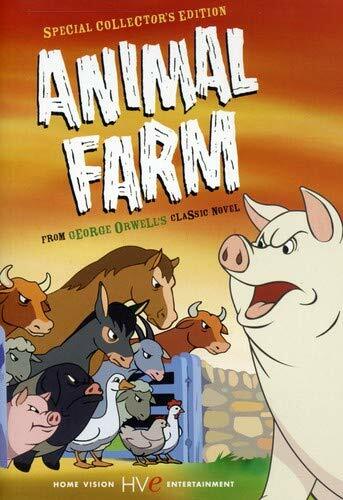 Take a look and see what others have said about Animal Farm. We want to know what you think, too!! Feel free to share your own opinion- we do want to hear from you! You can add your own comments here.